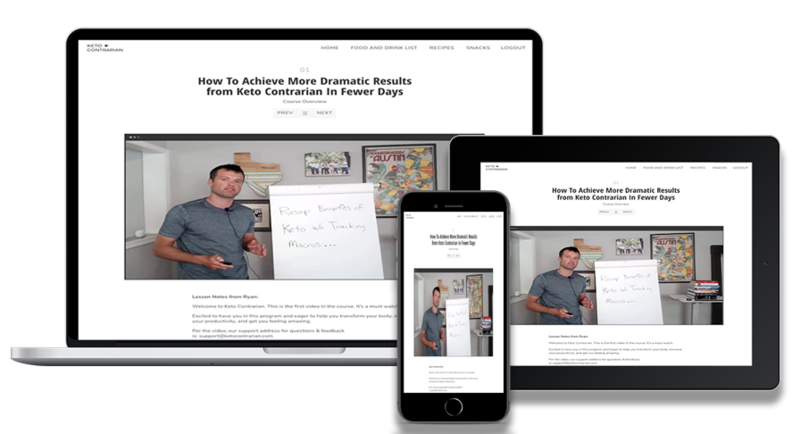 Keto Contrarian | Proven step-by-step system for reaping the benefits of keto without macro tracking or ketone testing. A very specific 5 step process to start, stick to & enjoy your keto diet (even if you have never tried keto before). The EXACT scripted conversation you need to have with your husband (or wife) to get his support and maybe even get him to try keto with you. The secret to reducing sugar, sweets, & carb cravings so you get the very best results from keto & generate the fastest fat loss (this literally changed Ryan’s physique). Free access to the 25 keto “hit recipes” that everyone in my family loves (my 3-year-old included) even though I live in a non-keto household. 7 Rookie Mistakes that slowed down my progress and opened me up to unnecessary judgment & peer pressure. Learn from my mistakes and skip em’.